At Andrew Roto Services, Inc., “We Restore, You Recover.” As the parent company to A. Roto Restoration and Budget King Carpet Cleaning, we provide professional restoration and cleaning services in the Chicagoland area to both residential and commercial customers. We are a local, family owned and operated, fully insured and bonded business with over 35 years experience serving the Chicagoland area and surrounding areas. 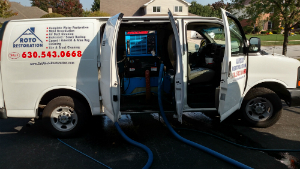 Our technicians provide the most advanced cleaning technology and restoration services in the industry today. We offer competitive prices and senior and military discounts. All of our services are 100% satisfaction guaranteed. With an A+ Accreditation by the BBB (Better Business Bureau), we represent their code of sound advertising, selling and customer service practices that enhance customer trust and confidence in business. No matter how big Andrew Services, Inc. gets we will always stay true to our beginnings as a family-run company that respects people over anything else. We value excellence, and are committed to growing a local company that sets the new standard for honesty, friendliness and professionalism. We look forward to earning your business. A. Roto Restoration specializes in mold inspection and remediation, water and flood damage and restoration, fire and smoke restoration, and reconstruction. We hold an IRI Mold Remediation Certification, realizing that most customers are looking for mold remediation training and certification when choosing a contractor for their mold remediation project. (Certification #18396). A. Roto Restoration will work with your insurance company whenever possible to make sure that you need pay only your deductible or any other costs not covered by insurance. In addition, A. Roto Restoration also performs bio-hazard clean up and removes any bio-waste recovered from a death, trauma or accident scene. We are Amdecon Certified and we meet the OSHA training protocol to be your environmental emergency response contractor. We offer 24/7 emergency service recognizing that in cases related to disasters, crimes and other life-threatening or traumatic events, removing the damage as soon as possible is necessary to ensuring peace of mind and a return to normal life. At A. Roto Restoration, we are driven by compassion and remain committed to the principle in which our company was founded: earning the trust of our customers … one customer at a time. You are important to us … we aren’t happy unless you are! Call A. Roto Restoration today at ­630­.­543­.­0668­ for your free consultation. For many years Budget King Carpet Cleaning (Budget King) has been at the front line of the carpet cleaning services industry with its exceptional service and years of experience. Although we specialize in carpet and rug cleaning and are experts in removing pet urine stains and odors, we also clean upholstery, draperies, mattresses, air ducts, dryer vents, tile, grout and hardwood floors. Our IICRC Certified clean and uniformed technicians use child, pet and environmentally safe cleaning agents. (Certification #164998). Budget King doesn’t just ‘sell’ cleaning solutions. We provide a friendly, personalized consultation to recommend the best possible cleaning solutions at a budget price “fit for a king”. We pride ourselves in treating our customers like “royalty” while delivering the utmost in quality customer service. We are committed to maintaining a standard of excellence and ultimately exceed your expectations. Budget King continues to thrive and grow based on our many referrals and five star ratings. Call Budget King today at ­630­.­543­.­0668­ to get your cleaning services scheduled! You’ll save more when you bundle our services.